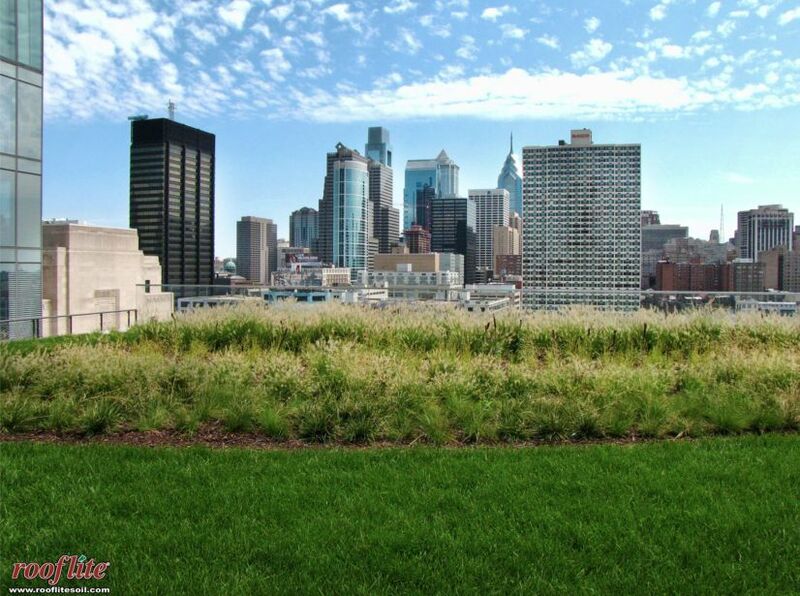 The Cira Green at Cira Centre South garage roof is located at 30th Street between Chestnut and Walnut Streets, Philadelphia, PA; visit the website. Cira Green’s scheduled operating hours are from 6 am to 10 pm during the summer months and 7am to 8 pm at other times of the year. Hours of operation are subject to the weather and can vary from time to time as Building Management deems appropriate. Watch the 2:38 Cira Green at Cira Centre South – Project of the Week 2/8/16 video from Greenroofs.com on the greenroofsTV channel on YouTube. Greenroofs.com Project of the Week video photo credits: All courtesy of rooflite; Roofmeadow – with 2 Photos ©Albert Vecerka/Esto; and Brandywine Realty Trust. See the Cira Green Media Kit from Brandywine Realty Trust. 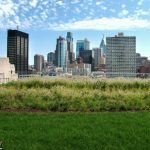 Read the December 18, 2015 Greening Philadelphia: The City’s First Elevated Park from the rooflite blog; November 24, 2015 Y’all: Cira Green is Frigging AMAZING! 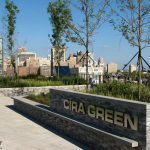 in StreetsDept; November 9, 2015 Brandywine Realty Trust Announces Opening of Cira Green at Cira Centre South Press Release; November 9, 2015 Blue Roof, Green Space, New City by Bradley Maule in HiddenCity Philadelphia. Learn about the following companies in The Greenroof & Greenwall Directory: rooflite; Roofmeadow; and Tournesol Siteworks. 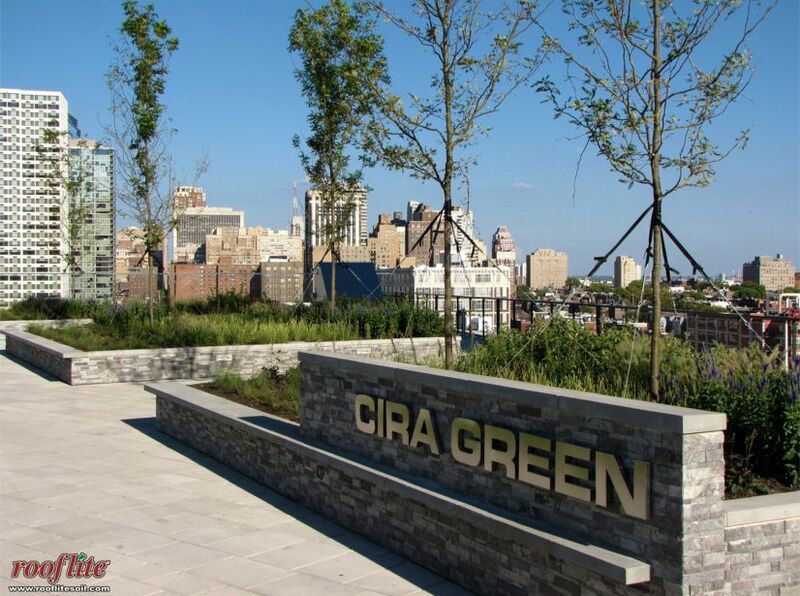 Located in the University City District of Philadelphia, Cira Green at Cira Centre South is the city’s first elevated park and part of developer Brandywine’s 2.7 million square foot mixed-use Cira Centre South neighborhood. 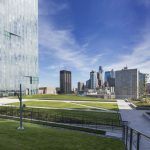 Tucked between the Evo Tower and the FMC Towers, Cira Green is a 1.25-acre oasis perched 11-stories atop the parking garage, offering much needed open public green space with amazing views of the Philadelphia skyline and the Schuylkill Riverfront. 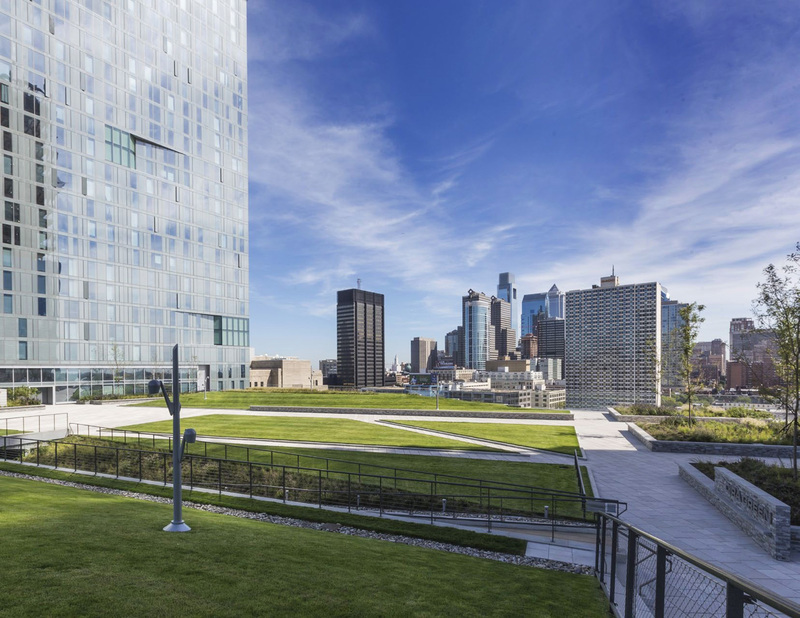 With slopes up to 20%, the Cira Green topography engages visitors; large portions of the roof deck are tilted, facilitating stunning views of the cityscape. The park’s shifting planes simultaneously generate a sense of protection and a desire to explore, but these intentional topographic lines also calm the otherwise aggressive winds, typical of most rooftop environments. The west side of Cira Green tilts upward, evoking a sheltered wall on the exposed roof. The center folds down to create a ramp to the existing 11th floor parking tier, revealing a covered support area that enables practical operational management of the event space. 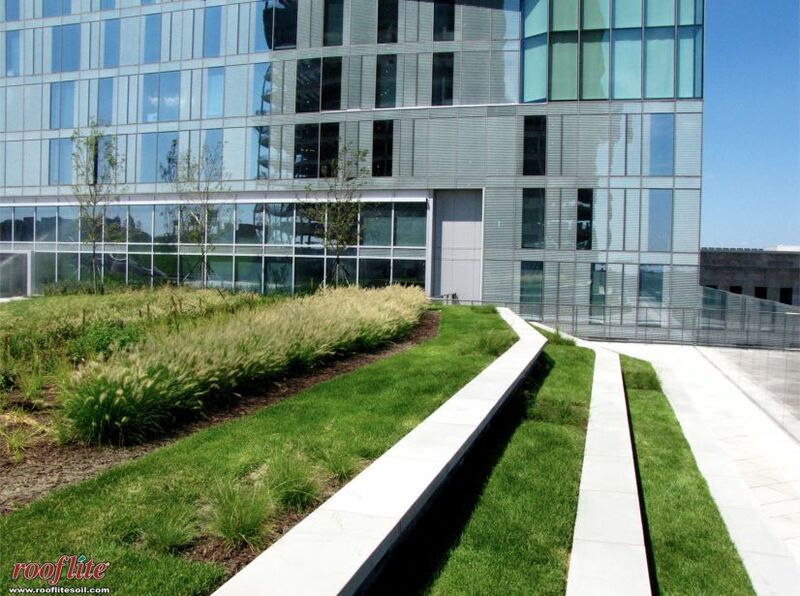 A terraced landscaped mound on the east side provides seating and more intimate spaces location for viewing the city skyline and the waterfront through clear glass guard rails. 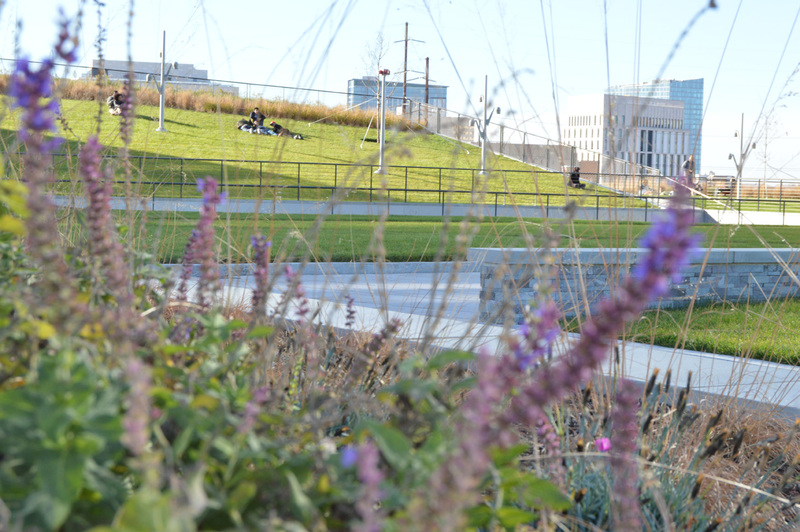 Cira Green consists of different green roof areas, including large lawn areas, meadows, planters with trees, and colorful perennials. Many of these are native to the Mid-Atlantic and all three species of trees planted on the green roof are native to the region. Within the meadow zones, five of the seven species of grass are native to the region, and seven of the eleven perennial species are native to the region. 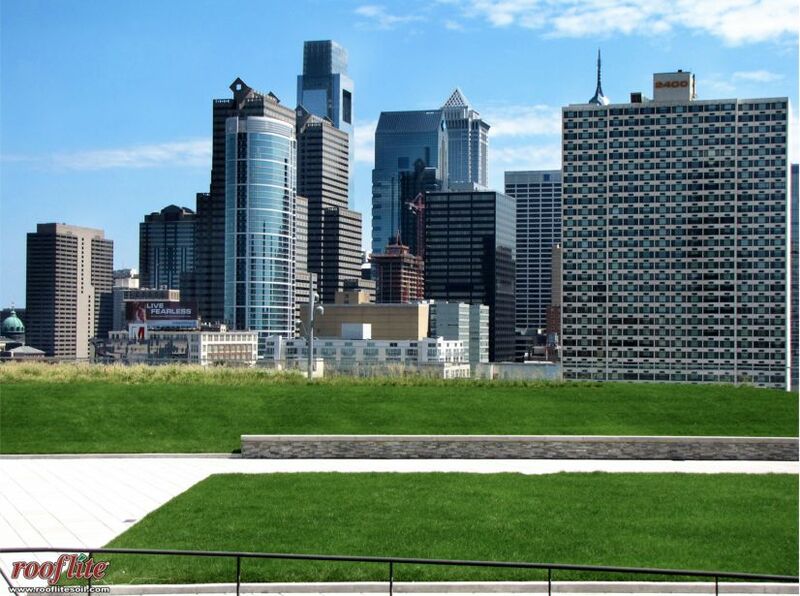 Designed by Roofmeadow, Cira Green has a unique water storage system beneath its sloping lawn, swaying meadows, and the pavers on the roof: Cira Green is Philadelphia’s first blue-green roof, which can route stormwater to the green roof areas. Installed in the fall of 2015, the 52,000 square foot elevated park sits atop a parking garage that was originally designed with the structural capacity to accommodate additional floors. The garage was intended to be a semi-public facility with three floors of parking and a stormwater cistern below grade. As the design for the adjacent towers progressed, however, the stormwater management strategy evolved. 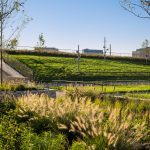 Brandywine and its design team conceived of a dynamic elevated amenity space that could simultaneously comply with Philadelphia’s strict stormwater regulations. As the current Cira Green design vision unfolded, the cistern below the parking garage was repurposed to manage stormwater runoff from the Evo and FMC Towers. Additional floors were added to the garage to accommodate the parking needs of the nearby IRS offices. 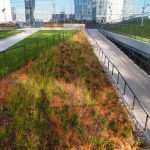 The stormwater benefits of a conventional green roof are grounded in the ability of the planted roof to absorb and evapotranspire direct rainfall. Fully planted green roofs, however, generally cannot sustain active use and frequent foot traffic. Dynamic, lively, high-use gathering spaces are usually paved. 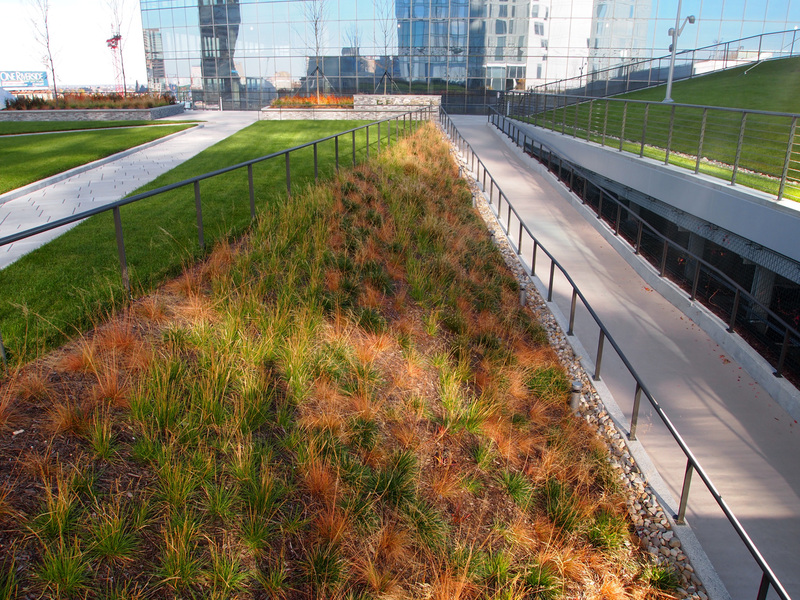 Cira’s green roof concept interweaves both imperatives and re-imagines rooftop paving designs. 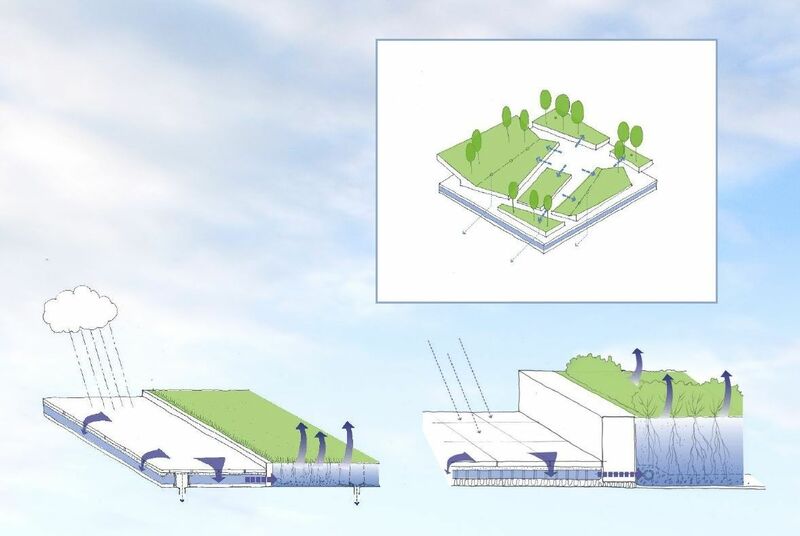 The paved walkways and plaza space on Cira Green are designed as a blue roof: Thin detention cisterns, dubbed “pancake cisterns” by Roofmeadow, placed below the paving, capture rainfall and release it gradually to the adjacent planted areas via a system of Sutro weirs. The specialized Sutro weirs regulate the flow of runoff from the cisterns. The unusual Sutro weir design assures that the rate of discharge is always proportional to depth of water impounded. At Cira Green, the Sutro weirs insure that the rate of discharge associated with a 2-inch rainfall will be exactly twice the rate of discharge for a 1-inch event. For this project, the benchmark discharge rate was 0.24 cfs/acre for 1 inch of rainfall. The Sutro weir also widens at the base, a feature that reduces the tendency for clogging. 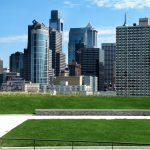 Without the pancake cisterns beneath the pervious pavers, Cira Green would not have complied with Philadelphia’s stormwater regulations. For the space to realize its potential, more pavement was required than the regulations allowed. Additional ground-level SMPs would have had to be installed elsewhere on the site. 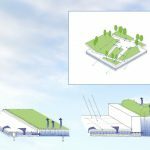 The cost and logistics of such ground-level SMPs justified the investment in the blue-green roof. 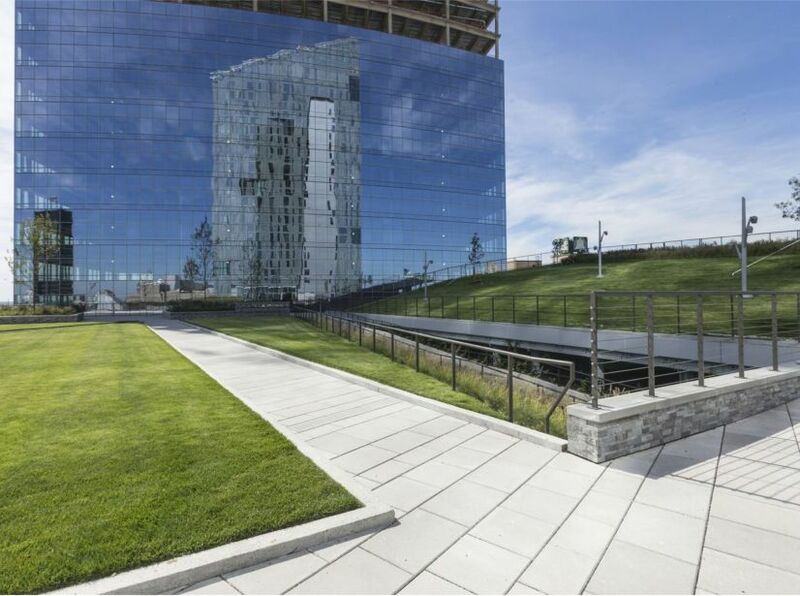 Total Area: 1.25 acres; Lawn Area: 22,159 sf; Trees, Shrubs, Grasses: 4,424 sf; Meadow: 3,984 sf; Vines: 511 sf; 11th Tier: 143 sf; Total Green Roof Area: 31,221 sf; Blue-covered water system: 16,200 sf; Number of access points: Currently 2 (with a third available mid-year 2016 via 2 elevators at FMC Tower at Cira Centre South); Number of trees: 18; Amount of soil: 2,002 cubic yards of green roof media were delivered to the site; Total project cost: approximately $13,000,000. – Delivery had to happen in January in cold temperatures with a blower truck installation.” Learn more about these logistical challenges and solutions from rooflite. VersiCell drainage underneath was provided by Tournesol Siteworks. 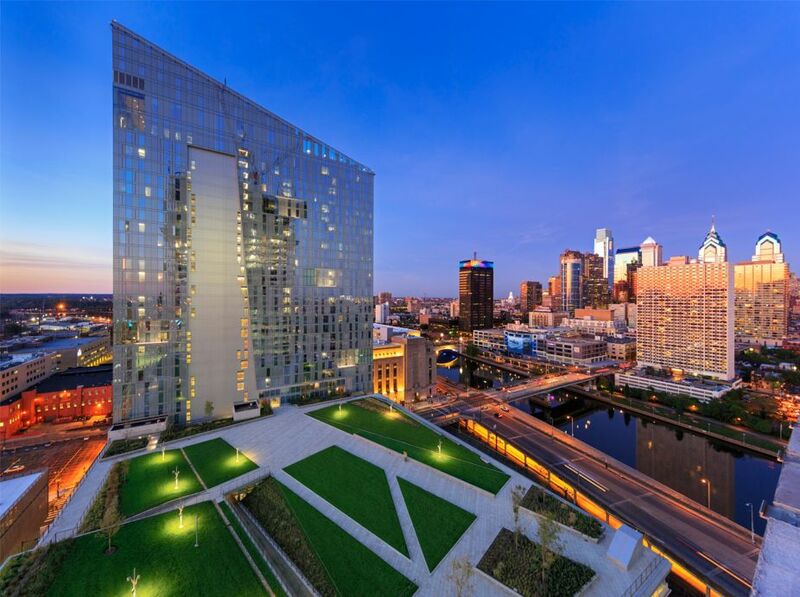 Adjacent to Cira Green is FMC Tower at Cira Centre South – Philadelphia’s first vertical neighborhood. Designed by world-renowned Pelli Clarke Pelli, it is a progressively designed urban mixed-use high-rise building comprised of highly efficient office space, luxurious residential units, flexible stay corporate suites, and world class amenities. The Residences at Cira Centre South will feature 268 brand-new, ultra-luxury hotel suites and apartment residences located on the tower’s upper 18 floors, offering some of the highest, breathtaking views in the city. 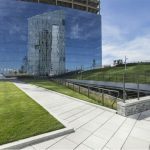 Together, Cira Green and the Evo, FMC and Cira Towers create a spectacular and inviting infill development bringing vitality to the west bank of the Schuylkill River. 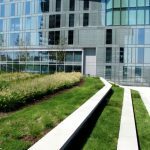 Cira’s innovative blue-green roof design provides a higher level of stormwater performance than conventional green roofs. 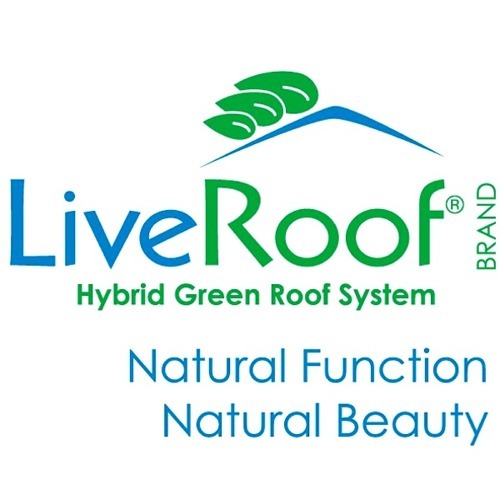 The combined blue-green design both regulates flow rate and treats runoff prior to discharge from the roof. 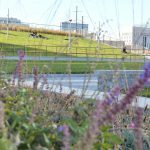 Moreover, integrating the park programming with stormwater management strategies avoided the cost of building additional at-grade measures to collect and treat runoff associated with the paved areas on Cira Green. 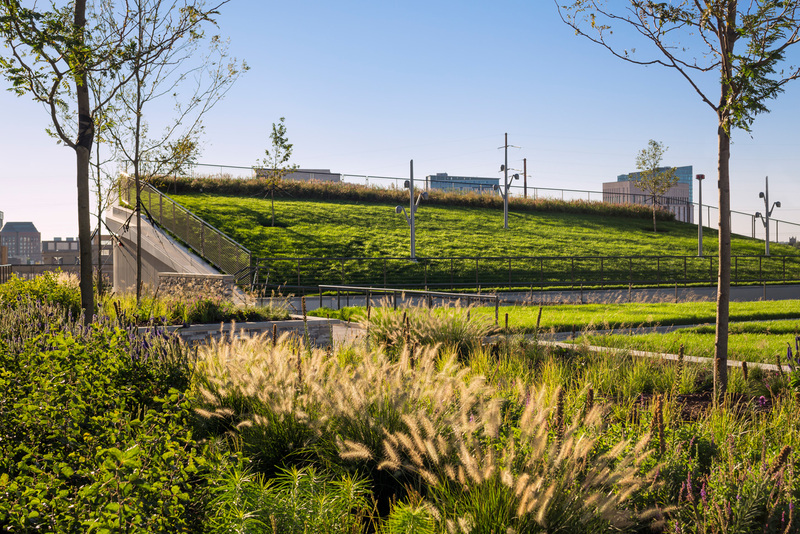 By artfully integrating an unobtrusive stormwater management strategy into this extensively paved, high-traffic park, Brandywine and the design team created a new standard for city living which leverages the roof plane for unparalleled amenity spaces that also aggressively manage stormwater. Although rooftops can be harsh, inhospitable environments, this blue-green roof creates a nurturing bubble and enhances quality of life. What could have been a concrete deck filled with cars is now a visually appealing urban amenity that sustains birds, crickets and butterflies.